Story added: 13 Sep 2007 22:07. Last updated: 30 Oct 2007 13:24. Another day, another Walkman branded handset from makers Sony Ericsson, but what sets this apart from the growing range of phones from the rest of the pack? We get dialling to find out. The W580 Walkman phone is your standard thin slider complete with 2-inch colour display a range of buttons on the front for quick access to menu features and a dedicated button to load up the MP3 player. A 2.5G, quad-band EDGE device (850/900/1800/1900) the phone offers Bluetooth connectivity and the usual array of features to get you talking. Slide open the handset, which also features a 2 megapixel camera, and you're presented with an easy to use keypad which doesn't break from the norm. Owners of previous Sony Ericsson handsets won't feel out of touch. However hidden beneath the exterior is a trick just waiting to be used to show off your new model to your mates down the pub; a built-in motion sensor. Perhaps taking a page out of Nintendo's book, the W580, like the Wii Remote, allows you to move the handset around to achieve certain results. Press a button and shaking it, not vigorously like a Polaroid picture, will allow you to go forward to the next track or back to the previous one while in the music mode. In our brief play the feature, which is luckily only turned on when you hold down a button rather than just doing it when it's in your pocket, works well but was more of a gimmick than a feature we think we would want day-to-day. However the shaking element isn't just used for moving on tracks. Following in the footsteps on the Nokia 5300, the W580 also has a built-in fitness trainer within its menu system including (and here is the shake bit) a pedometer that allows you to see how many footsteps you've taken that day at any given time, be it walking or running. Displayed in the bottom hand corner of the screen or via the dedicated interface off the menu, the device racks up the footfalls before resetting itself at midnight ready for your walk to work the next day. The information can be viewed on the screen in graph mode over time so you can see what were your busy walking days and you can export the data to load into a spreadsheet if you really are that bothered. Compared to the Nokia 5300, its certainly not as detailed, however Sony Ericsson are pitching this as an added extra at the moment rather than a full-fledged focus of the phone. 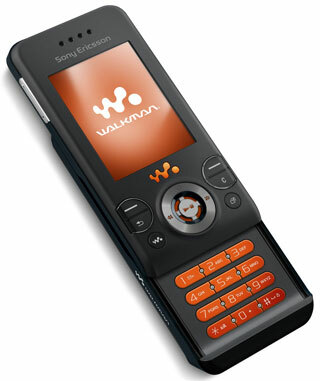 Other Sony Ericsson software such as the Blogger tool, the ability to find out what tracks you playing via the TrackID and a new feature called SensMe are also included. SensMe Scans your music tracks stored on your phone and then analysing the beats of the tracks, the music software allows you to select to play your tracks based on their rhythm. Options available vary from fast to slow, happy to sad and in our tests worked really well for grouping songs together to put you in a certain mode. We expect fast would be very good for a run for example while sad for those blue rainy days when your really can't be bothered. If you are looking for Walkman phone with a couple of added benefits, but not looking for one of the company's higher specced models, this will fit the bill nicely. The phone comes with enough memory to store 470 songs on the included Sony Memory Stick and you can of course expand it further by buying more memory as the need fits. Small and compact, you probably won't use the Shake music skipping feature that much, but for those vaguely interested the pedometer might encourage you to take the longer walk to work to shift a few pounds.